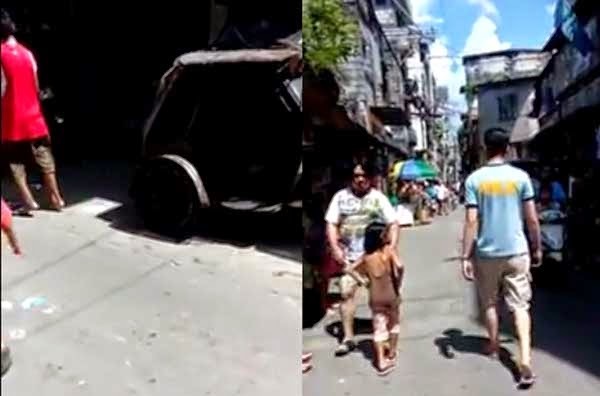 A video showing a policeman and street kid who are engaged in a shouting match in an unknown location in Manila is making rounds on social media. The clip, which is 1 minute and 13 seconds long, was uploaded last September 7 by Facebook user Joefrey Don-don Teaño, who told his FB friends to share the video. He said the policeman's opponent is a minor. In the video, the unidentified police officer dressed in a PNP athletic uniform is seen telling the boy to go home and stop stealing. While walking away, the street kid cursed the policeman and the exchange of foul words escalated. The boy even challenged him to a fist fight with his father. When asked by a passing motorist, the police officer said the street kid is a burglar. Netizens believe he was off-duty when the incident happened. Post by Joefrey Don-don Teaño.